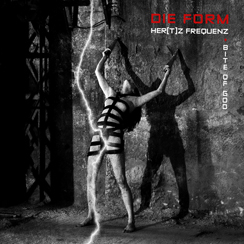 With their new single �Her(t)z Frequenz�, Die Form are now returning their concept art to the clubs. A driving beat builds the foundation for an energetic interplay between Fichots cold, electronically manipulated vocals and Eliane P.�s mesmerising, fairy-like melodies. The title track is a cunning combination of the catchiest grooves ever to be found on a Die-Form-release and the hypnotic interaction between coldness and emotions that has always been the unique trademark of this project. The b-side is a re-recorded version of the classic �Bite of God� which features new beats and more dominant female vocals and builds up to a magnificent rhythmic crescendo at the end � a stunning appetizer for the upcoming compilation of the group�s best tracks in newly recorded versions. The single is rounded off by exclusive remixes and alternative versions. With �Her(t)z Frequenz�, Die Form prove yet again that they are an absolutely unique act in today�s club scene and are bound to put an entire new generation under their spell. Interviews in German magazines ORKUS, SONIC SEDUCER & ZILLO.